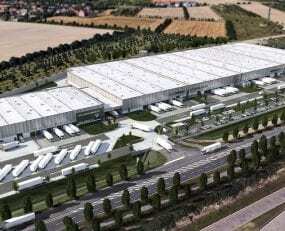 Goodman Group has started the construction of a new 50,000 sq m logistics centre in Leipzig, Germany. Located next to the Leipzig plant of the BMW Group, the build is Goodman’s third development for BMW in Germany. The development adds to the seven properties it manages for BMW in Landshut and Kleinaitlingen as well as in Australia, New Zealand and China. Goodman has also built a 125,000 sq m logistics property for DB Schenker, in Leipzig, which will be operated exclusively for BMW. In an attempt to improve efficiency, the logistics centre will feature a 4,000 sq m loading tunnel as well as sufficient storage space for pallets or production items. In addition, there’s office space over two floors. Leipzig has strategic importance for the automaker. The location has access across Germany close to the A9 and A38 autobahns while the A14 links the Leipzig logistics centre directly with Leipzig/Halle airport. The extensive rail network adds to the multimodal connections providing comprehensive infrastructure for the region.